An emotional support animal (ESA) is a US legal term for a pet which provides therapeutic benefit to its owner through companionship and affection. Emotional support animals are not specially trained to ameliorate disability as psychiatric service dogs are. They require only as much training as an ordinary pet requires in order to live peacefully among humans without being a nuisance or a danger to others. In the U.S., two federal laws grant special rights to some owners of emotional support animals. The Air Carrier Access Act establishes a procedure for modifying pet policies on aircraft to permit a person with a disability (including emotional) and a letter from a physician to travel with a prescribed emotional support animal so long as they have appropriate documentation and the animal is not a danger to others and does not interfere with others (through unwanted attention, barking, inappropriate toileting, etc.). The Fair Housing Amendments Act of 1988 (42 USC 3601, et seq.) establishes a procedure for modifying "no pets" policies in most types of housing to permit a person with a disability to keep a pet for emotional support. The qualified applicant may either make a verbal request, or send a written request of reasonable accommodation to the landlord, in either case with a letter from a physician. If the landlord refuses the request for accommodation, a complaint can be filed with the department of Housing and Urban Development or with the U.S. Department of Justice. In housing that allows pets but charges supplemental rent or deposits for them, these fees must be waived. The ESA's owner can be charged for actual damage done by the animal, but they may not require the applicant to pay a fee or a security deposit in order to keep the animal. Emotional support animals do not have the right to go anywhere other animals are not allowed with the exception of the two examples above. You get four Emotional Support Animal ID cards with your order, three for your companion and one for you to carry in your wallet so you can easily show others what the law says. These cards make it easy to educate the uninformed of your rights. Your Emotional Support Animal ID Tags clearly identify your companion as a Emotional Support Animal with his or her picture on the tag. The Fair Housing Amendments Act of 1988, Section 504 of the Rehabilitation Act of 1973, and Title II of the Americans with Disabilities Act protect the right of people with disabilities to keep emotional support animals, even when a landlord's or Association's policy explicitly prohibits pets. Because emotional support and service animals are not "pets," but rather are considered to be more like assistive aids such as wheelchairs, the law will generally require the Landlord or Association to make an exception to its "no pet" policy so that a tenant with a disability can fully use and enjoy his or her dwelling. In most housing complexes, so long as the tenant has a letter or prescription from an appropriate professional, such as a therapist or physician, and meets the definition of a person with a disability, he or she is entitled to a reasonable accommodation that would allow an emotional support animal in the apartment, condo or townhouse. Our Emotional Support Animal ID Tags clearly identify your animal as an Emotional Support Animal with his or her picture on the tag. We provide two cards with each order, one for your dog and one for you to carry in your wallet so you can easily inform businesses you ar an Emotional Support Animal owner. These cards make it easy to educate the uninformed of your rights. Get a FREE copy of the sample letters for No-Pet Housing Exemption and Airline Travel HERE. 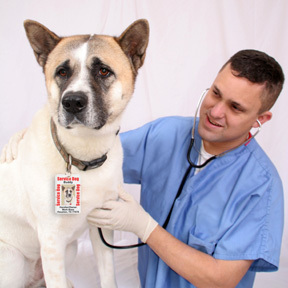 By themselves, our tags easily identify your pet as an Emotional Support Animal and are not as hot as a vest. Even if you do use a vest and patches our Emotional Support Animal id tags have your animals's photo and information on it. Unlike cheap laminated cards, ours are made of durable plastic thicker than credit cards with the ink infused into the plastic so it can't chip off. Our regular size tags measure 3.375" x 2.125" (85.6mm x 54mm) - standard credit card size. Our new small tags are just the right size smaller dogs and measure 2 1/8" x 1 1/8". Great company. Got it so fast too! Quality of everything that I ordered (collars, cards...) is fantastic. Really helps with a lot of ignorance about ESAs and service dogs out there. Less questions, less bothering me, and my "pets." Exactly as described. Fast Service. Great Product. Tags are great for hot weather or near water when a vest is to much. Very good precise and fast service. Love the product, got it faster than expected, and it's really nice quality. The small tag is perfect for putting on my dog's emotional support animal vest and I keep the large tag in my wallet. The tags are nice and official looking and the back of the large tag has good information for housing and travel so if people question you it's easy to show them the tag. It's nice to have 2 extra little tags for when the one I'm using breaks down or if I wanted to put one on his carrier for travel. This was the best option at the best price and I will definitely re-order when I need more tags. Service Dog Tags.com went above & beyond to make sure I received my tags in the time that I needed them. Them came out great & I've already referred them to my mother & my neighbor. Thank you so much!! Nice professional quick service, no questions asked when I take my ESA pug anywhere I go. I purchased for cards with my Shiloh's picture on them. The turned out very nice and authentic. I was very pleased with the product and with the picture on the badge. I will be moving in June and hope I can use Peeka's badge when I move into an apartment and I can bypass the security deposit and extra rent required. I have been mentally ill for 40 years and have dogs for emotional comfort and did not know this was available. Awesome service and product. Quick to respond to your emails and handle questions. Click the button below to add the Emotional Support Animal Tag Set for Small Animals (3 Sm, 1 Lrg) to your wish list.